Depression and Provigil - What's the scoop? Depression and Provigil – What’s the scoop? Depression and Provigil are two words you might be hearing lately after recent depression studies. A group of researchers conducted a study to evaluate the strength and safety of using the drug Modafinil (Provigil) for the treatment of people with bipolar depression. The results were published in August 2007. One of the most common symptoms of bipolar depression is fatigue, so it’s no surprise that scientists have chosen to research further on depression and Provigil. 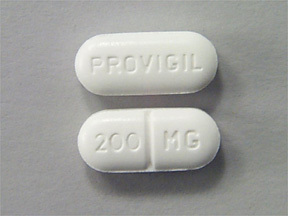 After all, Provigil is used to treat extreme sleepiness such as in narcolepsy (the sleeping disease). It works by changing the amounts of certain natural substances in the area of the brain that control sleep and wakefulness. What were the results of the Depression and Provigal study? Although the study was short — only 6 weeks — it found significant improvements in both response and remission rates for the group that took the Provigil (modafinil) as opposed to the placebo control group. The 2007 report in the American Journal of Psychiatry found that Provigil had a response rate of 44% in patients with bipolar depression, yet they call for larger studies to get firmer results. Depression and Provigil may not be ideal together due to the side effects. They include headaches and nervousness which may actually worsen the symptoms of depression. Provigil is becoming increasingly popular among doctors because it makes their patients more alert and active. Instead of spending the day in bed with depression, they are able to get up and do things, which many depression sufferers are unable to do. However, this sometimes means one cannot fall asleep. Insomnia is another unpleasant effect that may result from combining Provigil and depression. Most depression patients do not tolerate insomnia well, since it gives them too much time to think about being depressed and how bad life is, one of the primary reasons depression sufferers sleep so much. Provigil has other more severe side effects as well, which may mean that depression and Provigil are not meant to be. Symptoms such as nausea and infections have also been reported. While headaches might be tolerated, anxiety and nervousness are less likely to be acceptable side effects. While doctors will always prescribe medications (such as Provigil) to try to relieve depression, the side effects can be overwhelming. For this reason, many victims of depression are exploring their options, looking for alternative methods of relief. For some, a good supplement that combines herbs along with vitamins and minerals essential to mental health is the answer they are looking for. If you’re not sure about your battle of depression and Provigil being the answer, be sure to read below about how researchers are changing lives of bipolar depression sufferers thanks to the research on Omega 3s. It’s absolutely amazing. The research of Dr. Andrew Stoll reveals the benefit of Omega 3 fish oil for the depressed. Natural Cure for Depression: Is there one that works?" Vitamin B12 and Depression – For some of you, it’s that simple. Frye, MA et al. (2007). A placebo-controlled evaluation of adjunctive modafinil in the treatment of bipolar depression. Am J Psychiatry, 164(8):1242-9. Sachs GS et al. (2007). Effectiveness of adjunctive antidepressant treatment for bipolar depression. New England Journal of Medicine, Mar 28.